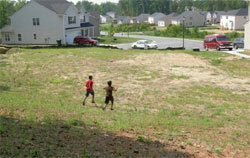 As a fun note, the children love the site and especially the hillside and large side yard to play in. As a former resident of the Mountain State, I am happy to see the kids get to be hillbillies� like I was at that age. Having plenty space for the kids to play is an excellent investment and can be rewarding for their imagination and health. The thought of back home brings me to think of all the water problems we had back in the Mountain State. So that was one of the main concerns I brought up. It was done well. No need for a sump pump. Education is always a concern for all parents. This was a huge task in and of itself. I was a daunting task that I did before we even considered looking at buying anything. We identified 7 school districts that we felt our family would be a good fit for. If your children go to public school, then it is important for you to choose which school district to live in. Oftentimes, the areas with the best schools have the most expensive rent and real estate. When you are choosing a school district, you should consider the curriculum that the school offers. Determine if it is suitable for your child. Good school districts provide comprehensive programs that support the students academically, emotionally, and socially throughout the school years. Make sure that the school is capable of providing high quality education to their students. Consider the neighborhood. Are the neighbors friendly, and the children well-behaved? Check out if the roads are clean and everything is orderly. Surely, you would not want to live in a dirty and chaotic area. The environment that you choose to live in will have a huge effect on the behavioral development of your child. The neighborhood children will most likely be his or her classmates, so make sure that you choose a neighborhood with people who can be good influences to your child. In order to find out whether a school district is promising, you should check out the official website. Typically, school districts put up a website to inform parents on what they have to offer. On the website, you will most likely see open records, profiles of teachers and school authorities, testing data, schedules of extracurricular activities, and the mission statement of the school. The professional development schedules of teachers, and resources for students and their parents are usually included, as well. In addition, most school districts post the schedules of their board meetings on their website. If you are interested in a prospective school district and want to make sure it meets your qualifications, you should attend at least one of these board meetings. Find out about their programs and how much money they have in their reserve. You should verify if they actually spend the money on useful and worthwhile projects that would benefit the student body. A school that allots an appropriate budget for the education and well-being of students is an ideal choice. Do not be afraid to stay after the meeting to introduce yourself to board members as a potential buyer in their neighborhood. Aside from the official website of the school district, you may also be able to gather useful information from other related websites. Look for comparison websites that rank schools based on different criteria. Usually, they provide comprehensive information such as test scores, parent reviews, school environment, district overviews, and sometimes, even houses for sale around the area. You can actually compare several schools at the same time. You should acquire results that consist of racial demographics, enrollment statistics, parental ratings, state test scores, among other detailed information. Furthermore, you can talk to other parents about good school districts. Join offline and online support groups, as well as discussion forums that are composed of parents in the area you plan to move in. Learn about the advantages and disadvantages of various school districts. Obtain honest opinions from parents who live in the area. Socializing with people who actually know what is going on around the place is perhaps the best way to find out about the schools available.